Soft Surroundings customers want to look and feel their best at all times. Our buyers have developed a selection of stylish women’s clothing that delivers with pieces that offer beauty, softness and unique style. This is a commitment that our company has to all of the products that we offer.Our assortment offers something for all occasions, including sleepwear, formalwear, resort wear and casual pieces. Still, there is something distinctive about all of our clothing. Many garments are exclusive to Soft Surroundings and feature delicate embroidery and beadwork. 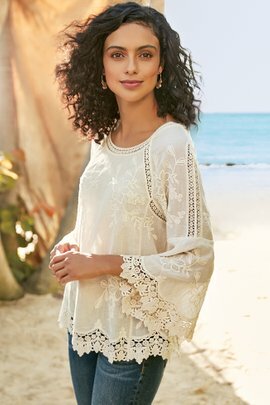 These embellishments catch the eye and help you to leave a favorable impression on everyone you meet.Garments are also assigned a “Softness Rating,” so you will know what to expect when making a purchase, even online. Ranging from “So Soft” to “Ultimate Softness,” this ranking of our comfortable women’s clothing by our team of testers ensures that you’ll enjoy wearing our clothing as much as you enjoy the compliments you receive.